First getting to the ship. We drove from our home in Ontario to Albany where we stayed overnight and then boarded the Yankee Trails Bus to NYC. This was most definitely the best spent money at $90pp round trip with delivery right to the pier and pick up from there afterwards. I definitely recommend them. 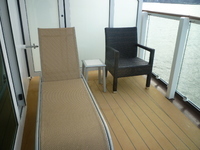 This was our second cruise with NCL and one we were very excited about because it was our very first time booking a suite. We had an aft-facing suite, not in The Haven. Last cruise I was on was Carnival and I found there was not much of interest to do during the day and the ship came alive with activities after 10:30 at night when I was too tired to enjoy them. Not so with this cruise. Our sea days seemed to be jammed with activities and just flew by. We had been to all ports on previous cruises so in San Juan we just got off the ship, walked over as far as the CVS, had an iced coffee across the street from there at Cafe Cola&apos;o and back to the ship. Last time in St. Thomas we had noticed that the Butterfly Gardens are directly across from the pier so this time we walked over there. We had a wonderful relaxing time there sitting among the many butterflies and taking pictures. And it was so inexpensive. Few people are going there and one employee told us they do not know how long they can stay open so give it a try. Because of the heat they even called one of the free shuttles and asked them to stop there and pick us up and take us back to the ship. Next stop was St. Maarten and that&apos;s where the health authorities waved us out to sea due to the number of people with the norovirus. So the &apos;average&apos; rating I give to this cruise would have been more but it was downhill from this point because that night I got the virus. By that time they were imposing a 48 hr. isolation instead of 24 hrs. Tortola was the place we had been to only once and we can still say that because we were not allowed out of our cabin. And I mean WE because my husband had to endure the isolation as well. We were very lucky to be in a suite with concierge and butler access because our butler brought our meals. My diet was restricted to jello, broth, rice, toast, or crackers and my husband could order from room service. I have heard horror stories of people not in suites waiting for hours for room service as they were overwhelmed. (I think our butler actually put together himself some of the meals we got.) Our butler also came and removed dishes and trays while other cabins were finding the trays piling up in their rooms as they were told not to put them in the hall yet no one would come to take them away. Finally the end of our isolation was in sight and we were told we could go out for dinner. So with perfect timing my husband said, "I feel sick." and so began another 48 hours of isolation for us both bringing us right up to disembarkation. There are a few errors in some previous reviews. First of all the ship usually does only have around 2300 guests but for this cruise there were over 2900 because it was March break for Ontario & Quebec kids and the ship was filled to absolute capacity. Secondly, the official report states that 4.4% of passengers got this virus. Anything over 3% means the US health authorities must investigate. It is definitely true that the ship appeared clean and when we were out and about there was constant wiping, cleaning, disinfecting going on. The crew was amazing throughout. However from what we experienced they were also not well informed as to procedures to follow during an outbreak of this magnitude. Although we were isolated we found many times where when we asked a question one answer would be given. If we phoned again for more info another answer was given. The concierge would tell us one thing, the butler another. And guest services were telling people in isolation who were asking a question...well you&apos;ll have to come down to the desk for us to help you with that. But I&apos;m in isolation. No matter, you have to come to the desk. Now how frustrating is that! And how stupid! Give employees the information they need to answer questions correctly! The worst thing that happened was people who were supposed to be in isolation being found eating at the buffet. Yes, they were found and escorted back to their cabin but how many people did they infect? It should not have happened but ....were they so frustrated by not being able to get through to room service that they just thought &apos;to hell with it&apos;? For us it was a disappointing cruise. We enjoyed the suite and were lucky to have the butler helping us out. Room steward was not allowed in the room and it took forever to get a crew to come in and clean the bathroom. We missed out on using our UBP and our UDP for quite a few days and these were things we had never had before. Rather than priority disembarkation we were escorted last off the ship. I know the outbreak cannot be blamed only on NCL but at the same time an offer of some onboard credit for another cruise would have really helped those who experienced so many negatives about the cruise. That said, I did put a deposit on another NCL cruise. I loved sailing out of NYC because we didn&apos;t have the air fare cost. Next March the Gem does exactly the same cruise again. Wouldn&apos;t it be nice for them to change the itinerary? Or change it every other week? San Juan and St. Thomas...please let us go somewhere else for a change! I&apos;ve got 4 years to use the deposit. I&apos;ll keep hoping for an itinerary change. First getting to the ship. We drove from our home in Ontario to Albany where we stayed overnight and then boarded the Yankee Trails Bus to NYC. This was most definitely the best spent money at $90pp round trip with delivery right to the pier and pick up from there afterwards. I definitely recommend them. 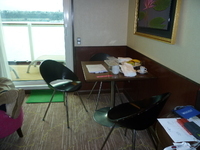 This was our second cruise with NCL and one we were very excited about because it was our very first time booking a suite. We had an aft-facing suite, not in The Haven. Last cruise I was on was Carnival and I found there was not much of interest to do during the day and the ship came alive with activities after 10:30 at night when I was too tired to enjoy them. Not so with this cruise. Our sea days seemed to be jammed with activities and just flew by. We had been to all ports on previous cruises so in San Juan we just got off the ship, walked over as far as the CVS, had an iced coffee across the street from there at Cafe Cola&apos;o and back to the ship. Last time in St. Thomas we had noticed that the Butterfly Gardens are directly across from the pier so this time we walked over there. We had a wonderful relaxing time there sitting among the many butterflies and taking pictures. And it was so inexpensive. Few people are going there and one employee told us they do not know how long they can stay open so give it a try. Because of the heat they even called one of the free shuttles and asked them to stop there and pick us up and take us back to the ship. Next stop was St. Maarten and that&apos;s where the health authorities waved us out to sea due to the number of people with the norovirus. So the &apos;average&apos; rating I give to this cruise would have been more but it was downhill from this point because that night I got the virus. By that time they were imposing a 48 hr. isolation instead of 24 hrs. Tortola was the place we had been to only once and we can still say that because we were not allowed out of our cabin. And I mean WE because my husband had to endure the isolation as well. We were very lucky to be in a suite with concierge and butler access because our butler brought our meals. My diet was restricted to jello, broth, rice, toast, or crackers and my husband could order from room service. I have heard horror stories of people not in suites waiting for hours for room service as they were overwhelmed. (I think our butler actually put together himself some of the meals we got.) Our butler also came and removed dishes and trays while other cabins were finding the trays piling up in their rooms as they were told not to put them in the hall yet no one would come to take them away. Finally the end of our isolation was in sight and we were told we could go out for dinner. So with perfect timing my husband said, "I feel sick." and so began another 48 hours of isolation for us both bringing us right up to disembarkation. There are a few errors in some previous reviews. First of all the ship usually does only have around 2300 guests but for this cruise there were over 2900 because it was March break for Ontario & Quebec kids and the ship was filled to absolute capacity. Secondly, the official report states that 4.4% of passengers got this virus. Anything over 3% means the US health authorities must investigate. It is definitely true that the ship appeared clean and when we were out and about there was constant wiping, cleaning, disinfecting going on. The crew was amazing throughout. However from what we experienced they were also not well informed as to procedures to follow during an outbreak of this magnitude. Although we were isolated we found many times where when we asked a question one answer would be given. If we phoned again for more info another answer was given. The concierge would tell us one thing, the butler another. And guest services were telling people in isolation who were asking a question...well you&apos;ll have to come down to the desk for us to help you with that. But I&apos;m in isolation. No matter, you have to come to the desk. Now how frustrating is that! And how stupid! Give employees the information they need to answer questions correctly! The worst thing that happened was people who were supposed to be in isolation being found eating at the buffet. Yes, they were found and escorted back to their cabin but how many people did they infect? It should not have happened but ....were they so frustrated by not being able to get through to room service that they just thought &apos;to hell with it&apos;? For us it was a disappointing cruise. We enjoyed the suite and were lucky to have the butler helping us out. Room steward was not allowed in the room and it took forever to get a crew to come in and clean the bathroom. We missed out on using our UBP and our UDP for quite a few days and these were things we had never had before. Rather than priority disembarkation we were escorted last off the ship. I know the outbreak cannot be blamed only on NCL but at the same time an offer of some onboard credit for another cruise would have really helped those who experienced so many negatives about the cruise. That said, I did put a deposit on another NCL cruise. I loved sailing out of NYC because we didn&apos;t have the air fare cost. Next March the Gem does exactly the same cruise again. Wouldn&apos;t it be nice for them to change the itinerary? Or change it every other week? San Juan and St. Thomas...please let us go somewhere else for a change! I&apos;ve got 4 years to use the deposit. I&apos;ll keep hoping for an itinerary change. Excellent cabin. Off by itself in the hallway. The largest balcony of all the aft suites. Steward&apos;s linen closet outside of door but this was rarely a problem except that he tended to do our cabin last so he ended there. Would definitely book this cabin again. Inexpensive. Close to ship. Very relaxing. Great for pictures.